Capital & Dominion Radiator is a Gatineau garage that was was founded with one goal in mind: to provide courteous, professional and unparallelled Radiators, Compressors and C V Axles services to residents of Gatineau and outlining areas. Over the years, we have succeeded in becoming the number one body shop, auto repair and maintenance service in the Gatineau area thanks to our ability to listen to our customers' needs and the sheer quality of our work. We are proud of what we can offer the Gatineau garage community, and that pride shines through every project we undertake, big or small. Our experienced and skilled mechanics are devoted to making Capital & Dominion Radiator the very best Gatineau garage around. Their work is a reflection of our commitment to ensuring that every vehicle that comes our way is serviced thoroughly and with an unequaled attention to detail. Our priority is ensuring the satisfaction and safety of our customers, and we spare no effort to ensure that they are safely back on Gatineau's road in a timely and affordable manner. If you have ever had to deal with Gatineau garages or auto repair shops before, you may have been disappointed by the way you have been treated. Some professional Gatineau garage mechanics take it upon themselves to tell you what you need without taking the time to listen to your preferences, or worse, to answer your questions. At Capital & Dominion Radiator, we understand that not everyone is a qualified mechanic, but above all, we feel that you should know exactly what you pay for and understand why we may recommend some additional work on your vehicle. We strongly believe that no customer should agree to any work order without being fully aware of exactly what it consists of and why it is being performed. 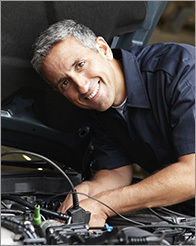 Capital & Dominion Radiator is a Gatineau garage in which you can have confidence. We will never try to push work that is not necessary, and always take the time to explain exactly what is being done and why. If you are located in the greater Gatineau area and are looking for a trustworthy Gatineau garage that will efficiently service your vehicle within time and budget, look no further. Capital & Dominion Radiator is looking forward to hearing from you, and to getting you back on the Gatineau roads safely and as quickly as possible.